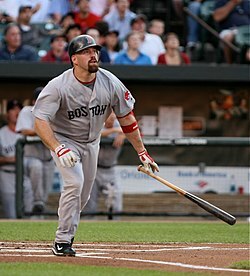 Kevin Edmund Youkilis (/��juːkəlɪs/; born March 15, 1979), also known as "Youk" /ˈjuːk/, is an American former professional baseball first baseman and third baseman, who primarily played for the Boston Red Sox. A native of Cincinnati, Ohio, he was drafted by the Red Sox in 2001, after playing college baseball at the University of Cincinnati. 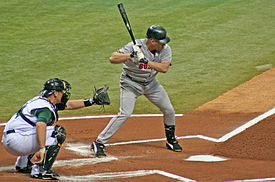 He played in Major League Baseball (MLB) for the Red Sox, the Chicago White Sox, and the New York Yankees. He is currently a special assistant to the Chicago Cubs and former Red Sox GM Theo Epstein. During the offseason the Red Sox acquired All-Star first baseman Adrian Gonzalez, and with the imminent departure of Adrián Beltr��, Youkilis agreed to the make the switch back to third base. —former Red Sox manager Terry Francona, referring to his nickname, the "Greek God of Walks"
Wikimedia Commons has media related to Kevin Youkilis.